Once again the austral winter is ending, and with it ends the field season for the scientific team studying humpback whales in New Caledonia. Through my PhD, I have become as migratory as my study species so this is also the time for me to fly back to Oregon for an intense 3 months of data analysis at the GEMM Lab. But before packing, it is time for a sum-up! In 2014, the government of New Caledonia has declared all waters of the Economic Exclusive Zone to be part of a giant marine protected area: the Natural Park of the Coral Sea. These waters are seasonally visited by a small and endangered population of humpback whales whose habitat use patterns are poorly known. 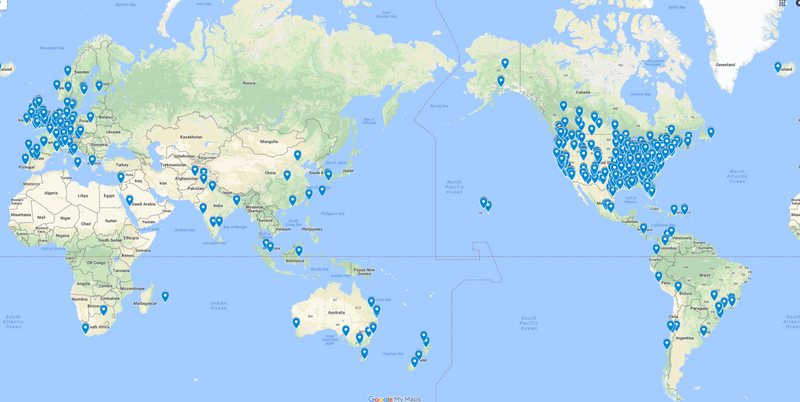 Indeed, the park spans more than 1.3 million km2 and its most remote and pristine areas therefore remained pretty much unexplored in terms of cetacean presence… until recently. 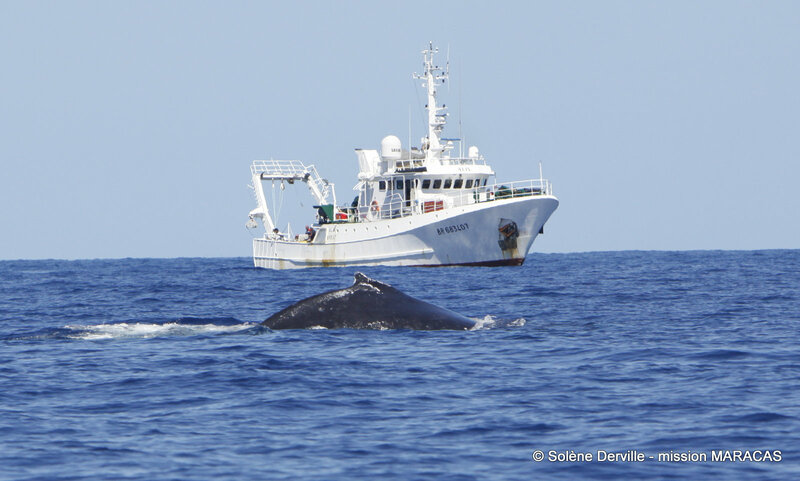 In 2016, the project WHERE “Humpback Whale Habitat Exploration to improve spatial management in the natural park of the CoRal Sea” was launch by my PhD supervisor, Dr. Garrigue, and I, to conduct surveys in remote reefs, seamounts and shallow banks surrounding New Caledonia mainland. The aim of the project is to increase our understanding of habitat use and movements of humpback whales in breeding grounds over a large spatial scale and predict priority conservation areas for the park. Fig. 1. A humpback whale with our research vessel, the oceanographic vessel Alis, in the background. – Chesterfield and Bellona reefs that surround two huge 30- to 60m-deep plateaus and are located halfway between New Caledonia and Australia (Fig. 4). Considered as part of the most pristine reefs in the Coral Sea, these areas were actually identified as one of the main hotspots targeted by the 19th century commercial whaling of humpback whales in the South Pacific (Oremus and Garrigue 2014). Last year’s surveys revealed that humpback whales still visit the area, but the abundance of the population and its connection to the neighboring breeding grounds of New Caledonia and Australia is yet to establish. Fig. 2. 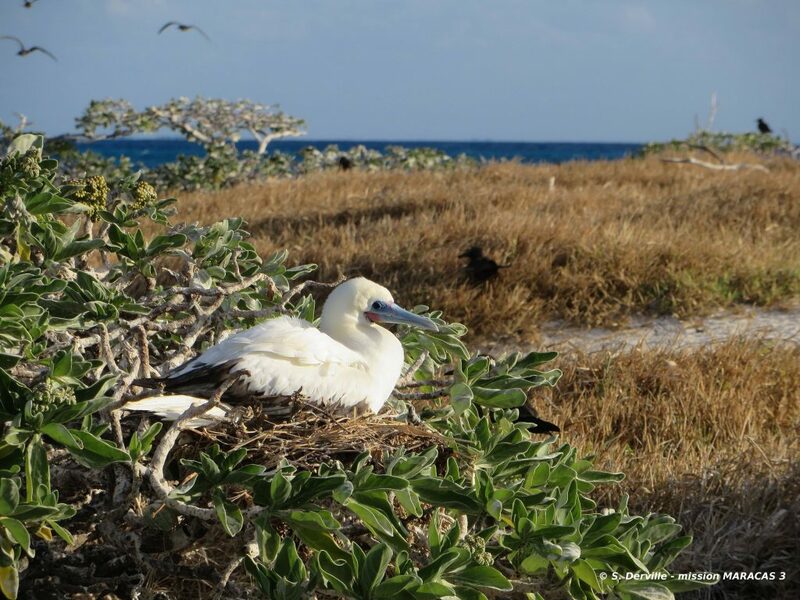 The tiny islands along the Chesterfield and Bellona reefs also happen to host nesting sites for several species of boobies and terns. Here, a red-footed booby (Sula sula). – Walpole Island and Orne bank are part of the shallow areas East of the mainland of New Caledonia (Fig. 4), where several previously tagged whales were found to spend a significant amount of time. This area was explored by our survey team for the first time last year, revealing an unexpected density of humpback whales displaying signs of breeding (male songs, competitive groups) and nursing activity (females with their newborn calf). Fig. 3. The beautiful cliffs of Walpole Island rising from the Pacific Ocean. Antigonia seamount, an offshore breeding site located South of the mainland (Fig. 4) and known for its amazingly dense congregations of humpback whales. 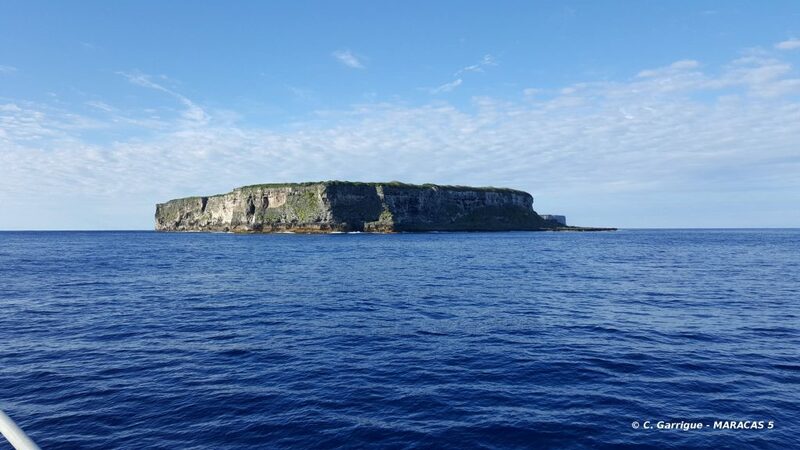 The seamount rises from the abyssal seabed to a depth of 60 m, with no surfacing island or reef to shelter either the whales or the scientists from rough seas. Fig. 4. 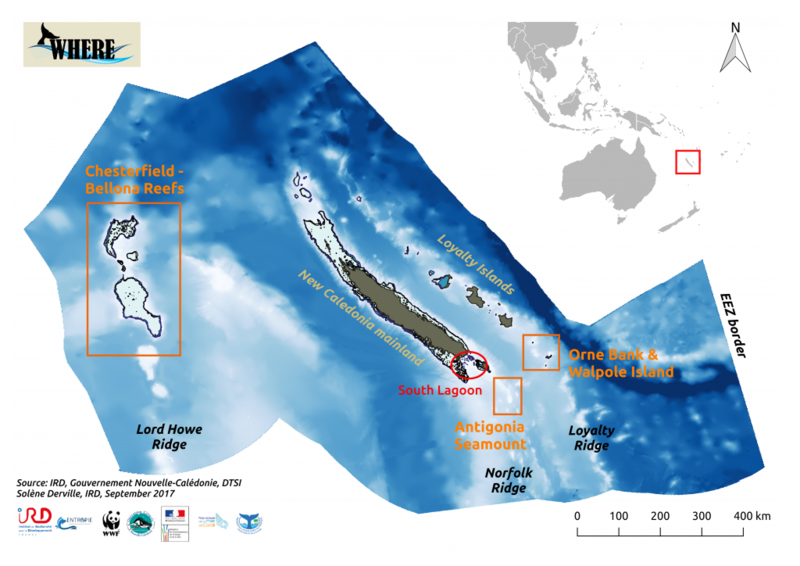 Map of the New Caledonia Economic Exclusive Zone (EEZ) and the project WHERE study areas (MARACAS expeditions). During our three cruises, we spent 37 days at-sea while a second team continued monitoring the South Lagoon breeding ground. Working with two teams at the same time, one covering the offshore breeding areas and the other monitoring the coastal long-term study site of the South Lagoon, allowed us to assess large scale movements of humpback whales within the breeding season using photo-ID matches. This piece of information is particularly important to managers, in order to efficiently protect whales both within their breeding spots, and the potential corridors between them. So how would you study whales over such a large scale? Well first, find a ship. A LARGE ship. It takes more than 48 hours to reach the Chesterfield reefs. The vessel needs to carry enough gas necessary to survey such an extensive region, plus the space for a dinghy big enough to conduct satellite tagging of whales. All of this could not have been possible without the Amborella, the New Caledonian governement’s vessel, and the Alis, a French oceanographic research vessel. Second, a team needs to be multidisciplinary. Surveying remote waters is logistically challenging and financially costly, so we had to make it worth our time. 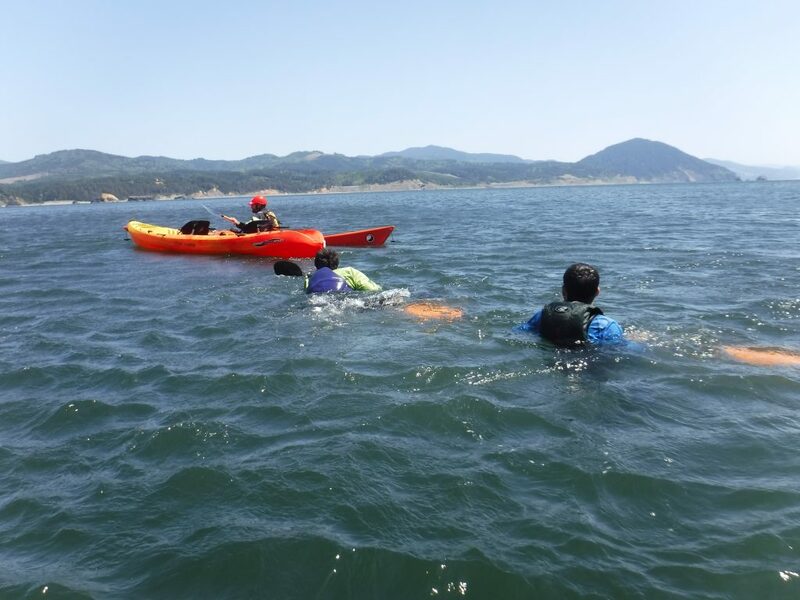 This season, we combined 1) photo-identification and biopsy samplings to estimate population connectivity, 2) acoustic monitoring using moored hydrophone (one of which recorded in Antigonia for more than two months, Fig. 5), 3) transect lines to record encounter rates of humpback whales, 4) in situ oceanographic measurements, and finally 5) satellite tracking of whales using the recent SPLASH10 tags (Wildlife Computers) capable of recording dive depths in addition to geographic positions (Fig. 6). Fig. 5. 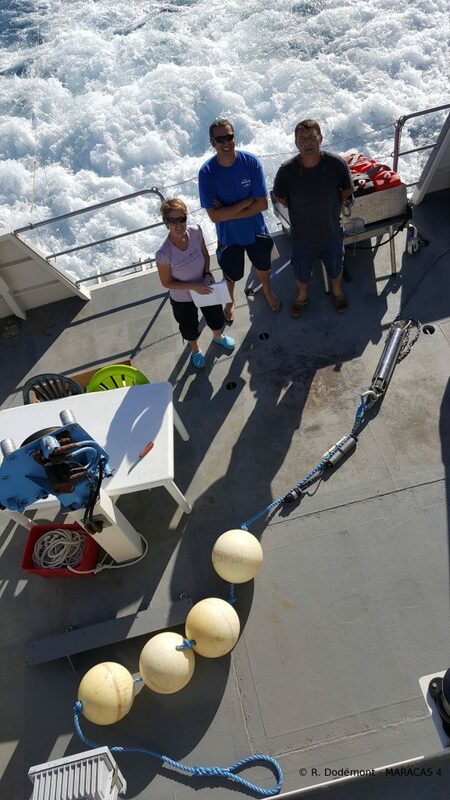 Claire, Romain and Christophe standing next to our moored hydrophone, ready for immersion. Satellite tracks and photo-identification have already revealed some interesting results in terms of connectivity within the park and with neighboring wintering grounds. Preliminary matching of the caudal fluke pictures captured this season and in 2016 with existing catalogues showed that the same individuals may be resighted in different regions of the Park. For instance, some of the individuals photographed in Chesterfield – Bellona, had been observed around New Caledonia mainland in previous years! This match strengthens our hypothesis of a connection between Chesterfield reef complex and New Caledonia. Fig. 6. 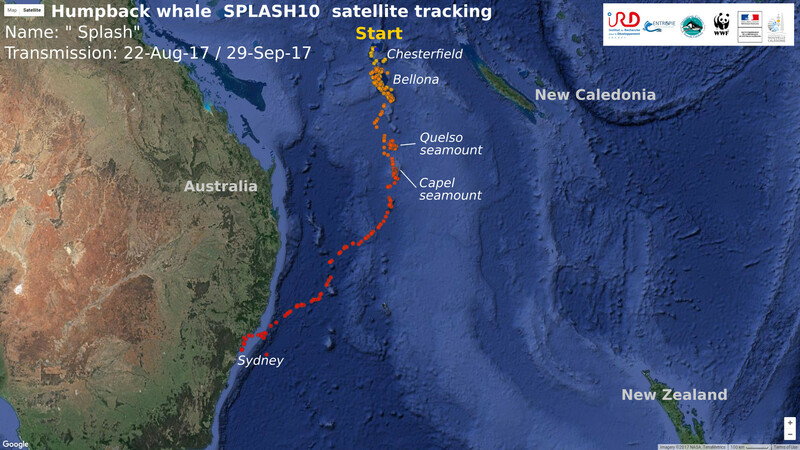 “Splash” was tagged in Chesterfield in August and after spending some time in Bellona it initiated a migration south. Seamounts seem to play an important role for humpback whales in the region, as “Splash” stopped on Kelso and Capel seamount during its trip. 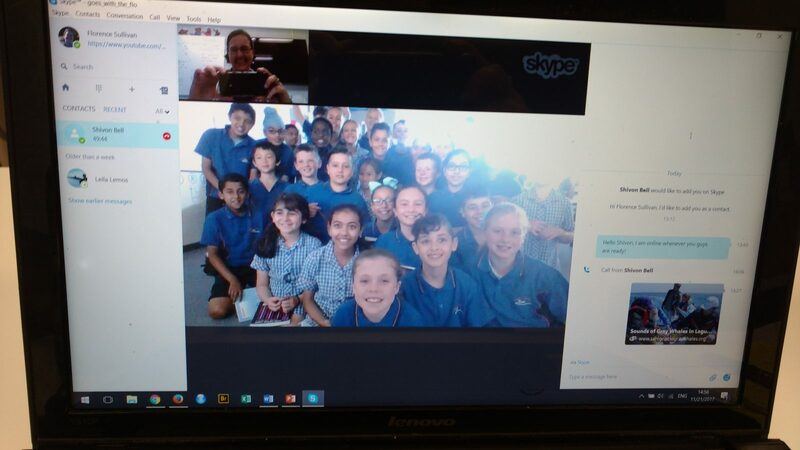 It reached the Australian coast a couple of days ago and we are looking forward to discover the rest of its route! While humpback whales often appear like one of the most well documented cetacean species, it seems that there is yet a lot to discover about them! 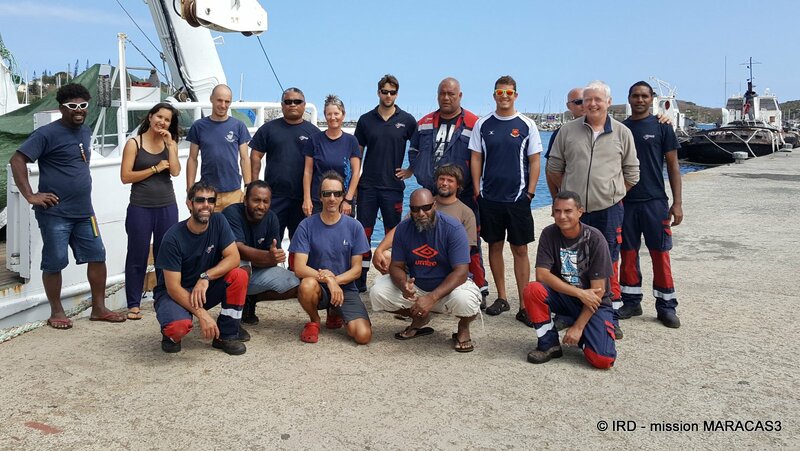 These expeditions would not have been possible without the financial and technical support of the French Institute of Research for Development, the New Caledonian government, the French Ministère de la Transition Ecologique et Solidaire, and the World Wide Fund for Nature. 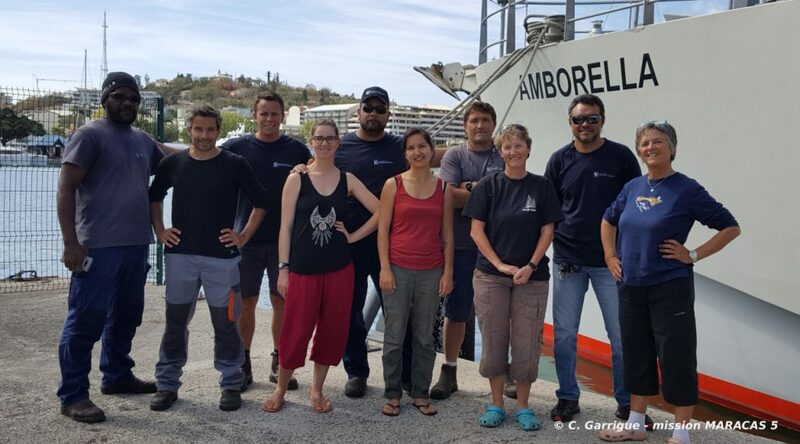 And of course, many thanks to the Alis and Amborella crews, and to our great fieldwork teammates: Jennifer Allen, Claire Bonneville, Hugo Bourgogne, Guillaume Chero, Rémi Dodémont, Claire Garrigue, Nicolas Job, Romain Le Gendre, Marc Oremus, Véronique Pérard, Leena Riekkola, and Mike Williamson. Fig. 7A. The teams of the three 2017 MARACAS expeditions (Marine Mammals of the Coral Sea). Fig. 7B. The teams of the three 2017 MARACAS expeditions (Marine Mammals of the Coral Sea). Fig. 7C. 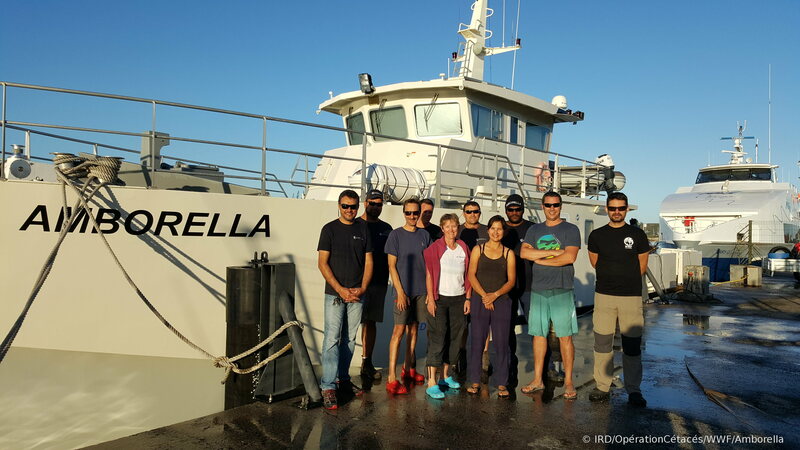 The teams of the three 2017 MARACAS expeditions (Marine Mammals of the Coral Sea).